One of the highlights of IMEx is the Food and Craft Market held in Silver Street. 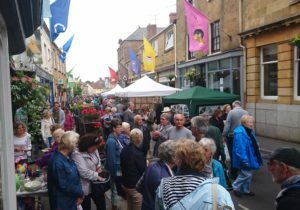 Over 30 stalls feature a range of local food and crafts including: jams and preserves; cider; honey; breads, cakes and buns; meats, pies and burgers; jewellery; photography; embroidered pictures; glass and enamels; scarves; clothes and much more. All of the town’s independent shops will be open for business as well as the cafes, restaurants and local pubs. We have many glowing reports from both visitors and stallholders who come back year after year. 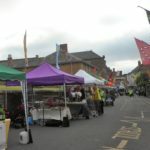 The town is decorated with over 100 flags and banners and the buskers will be in various places helping to make it a very entertaining and interesting day for all. A list of stall holders for 2019 will be available soon.